Boat ownership gives people a unique way to connect with others, nature, and themselves. Owning a boat is a great pastime in and of itself, and provides opportunities to enjoy fishing, water sports, and relaxing cruises on the water. It’s also an educational learning experience. You will learn more about boating the more time you spend doing it, but there are some laws and general guidelines you should be aware of even before your first time on the water. Here are some boat basics beginners can learn to help ensure a positive experience. If you’re thinking about buying a boat, research all the available options to make sure you’re making the best choice. All boats offer their strengths, so it pays to understand what you want from a boat and find one that can meet your needs. Talk to an expert to determine if you should buy new or start with a used boat. A professional can make sure you’re not overlooking any necessary gear. boating authorities or ask a boating expert in your area. If you’re planning an outing far in advance, check in on the weather periodically to see what you can expect. It may affect what you need to bring with you, or it may make the outing too dangerous even to attempt. Because weather can change with little warning, make sure you check again right before you head out on the water. There is all kind of great gear available to make your time on the water even more enjoyable. Consider what kind of equipment you want to use to make your time on the water more comfortable, and what kind of toys you’ll want to play with. Some gear is designed to keep you safe on the water, and this is of utmost importance. Never go out on the water without at least one lifejacket per person, even if you are a great swimmer. Bring a first aid kit to help reduce danger in case of an emergency. Sunscreen is also a great addition to your boating gear. In many cases, your gadgets can only be as effective as the person using them. Make sure you understand how to operate all of your boat systems, including navigation devices and safety equipment. The same applies for fun add-ons like fishing gear and water sports equipment. You should at least have a simple mechanical understanding of how the boat itself works. It is unnecessary and dangerous to start boating without some instruction and training. Luckily, there are all kinds of resources for you to use. Ask an experienced friend to help you out or hire a professional. The internet and your local boating communities can help you get started in the right direction. Look into boating clubs and other organizations if you have a hard time finding the right guidance. Additionally, the experts at Nautical Ventures will properly show you how to operate and drive your new boat during a sea trial. Create a float plan and leave it on the shore before you head out on the water. You can leave this someplace easy to find or give it to a friend. In the unfortunate event that something goes wrong, people can reference your float plan and see where they should look for you. Weather can change quickly, so it’s helpful to have additional layers. You may even want a spare set of clothes to change into in case you get wet. Consider keeping spare clothes with your other valuables in waterproof containers. A tool set is a must-have, even if you aren’t especially great with your hands. Make sure you learn enough to at least fix small problems and have the parts required to do so. 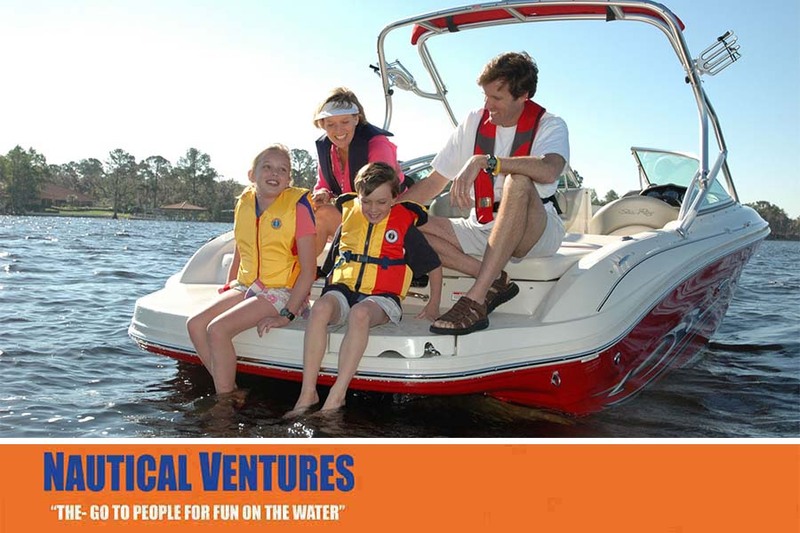 We at Nautical Ventures have been helping boating enthusiasts for over 30 years. Our knowledgeable experts can answer all your questions about which equipment is right for you. We also have a diverse inventory of new and used boats available. See us at any of our three locations to get started today!